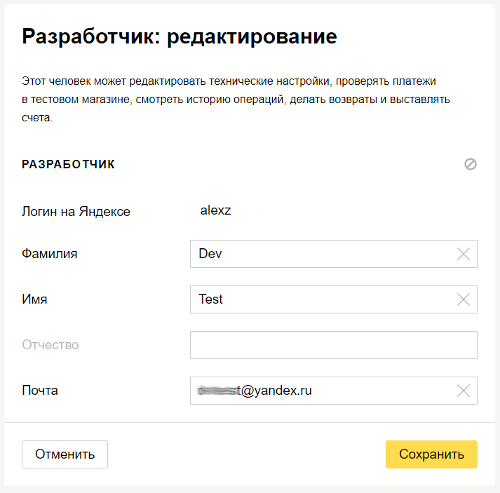 You can invite a Developer to help with the Yandex.Checkout onboarding process give by giving a limited access to your Merchant Profile to the specialist who will set up the integration for you. To invite a Developer, you need to link your phone number to the Merchant Profile. The Developer can edit technical settings, check payments in the Demo store, view transaction history, make refunds, and issue invoices. Access to editing store settings is available to both the Owner and the Developer. If you edit settings, you can accidentally change or delete technical information provided by the Developer, and this might affect the store's operation. 1. Find the Invite a developer block on your Merchant Profile's main page and click Give access. 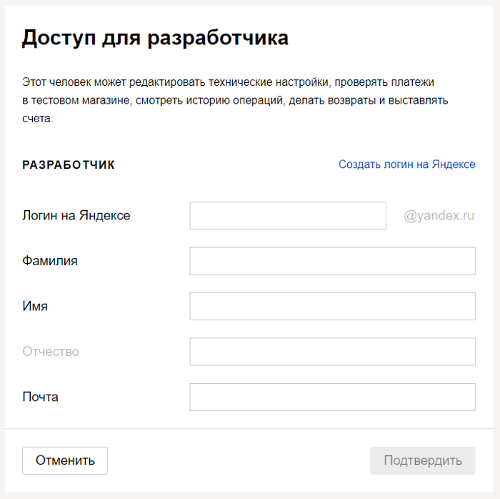 Login at Yandex — to signing in to your Merchant Profile. 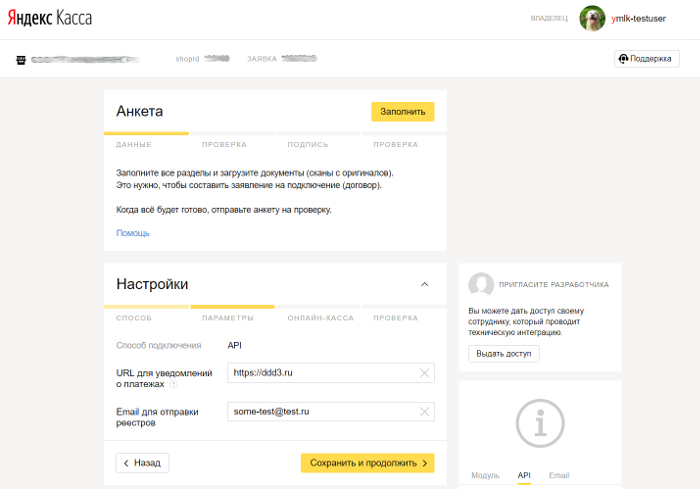 If this login already has access to another Yandex.Checkout Merchant Profile, you will not be able to invite it, so create a new one. 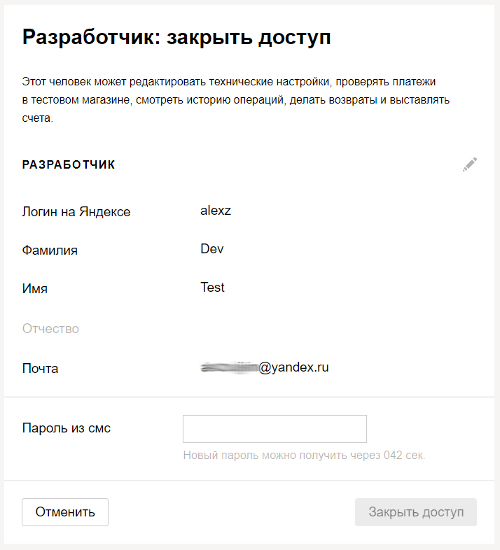 Email address — for receiving emails from Yandex.Checkout. 3. When everything is filled out, click Confirm. After that, you will receive a text message with a password to the linked phone. Enter it into the Text message password field and click Continue. 4. You will see a message that you have added a Developer. This specialist now has access to your Merchant Profile. After you add the developer, the Invite a Developer section on the main page of the Merchant Profile will be replaced by Developer. 1. Click the pencil icon in the Developer section. 2. You will see a form for editing Developer's information, where you can edit their first and last name, as well as the email address. 3. Make the required changes and click Save. You will receive the text message with the password to the linked phone. Enter it in the Text message password field and click Continue. After that, you will see a message notifying you of editing the Developer's details. 1. Click on the crossed out circle icon in the Developer section. 2. You will be redirected to the access blocking page, and a text message with the password will be sent to your phone. Enter it in the confirmation form and click Cancel access. 3. After that, you will see a message notifying you of blocking Developer's access. This specialist won't be able to log in to your Merchant Profile.